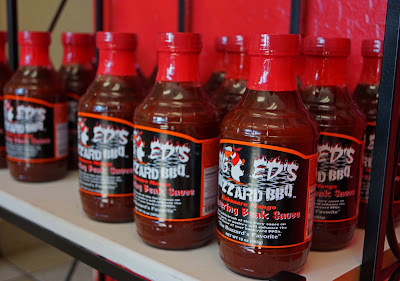 Our culinary journey brings us to Big Ed’s Buzzard BBQ. 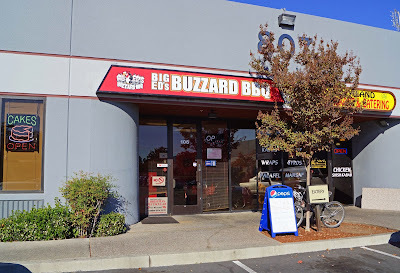 Our destination is located in Santa Clara, California, in an industrial park. The location is a little unusual for a restaurant. It is situated in the back of a light industrial court. In fact we drove right by the location on our first pass. There is no signage on the street. You know you have arrived by the presence of Big Ed’s large colorful catering trailer. Through the doors, you will be greeted by Big Ed’s daughter Tiffany. The interior is small with several tables. You can see into the back area which is a large commercial kitchen. Big Ed’s shares his kitchen with a dessert baker who also has counter space in the front. We meet Big Ed as he is rushing out the door to a catering job. His restaurant is a family run affair. Big Ed’s son, Big Ed Jr. is cooking today. I survey the menu and asked Tiffany what is popular. She say’s the smoked corned beef is very good. She also says her favorites are the ribs and brisket. Say no more that is my favorite too. Big Ed Jr. did give me a taste of the smoked corned beef and it was mighty tasty. At your table two bbq sauces in squeeze bottles are offered. Habanero/mango and blackberry are the two flavors. I give them a try, gambling with the wrath of habanero sting. The habanero mango is pretty tame in the heat department. It is tomato based with habaneros that is tamed by the sweet mango’s. The vinegar adds a little vibrancy to this mixture. The blackberry is also tomato based and is pleasant. It is a nice touch that sauce is offered on the side. These sauces are also offered for sale. The plate of bbq arrives and it looks yummy. The ribs are falling apart tender. There is a nice smoke flavor. It paired well with the habanero/mango sauce. The brisket was my favorite. It had a great smoke ring. It was tender with a lot of beefy flavor. The sides were all house made. The beans and slaw satisfied. If I could find any fault with this meal it would be the cornmeal muffin. It was just a little dry for my liking. 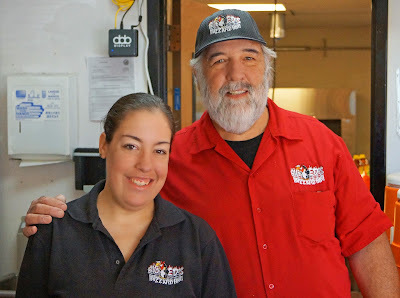 Big Ed is a competitive cooker, caterer, and bbq class teacher. He has a very nice family run bbq restaurant to show off his cooking skills. Stop on by and give it a try. Just bring your map or pay attention to the lovely lady on the GPS. That plate looks pretty good. Strip mall BBQ always worries me. But, that looks good. Three Dogs BBQ, It was an industrial court/strip mall. You would not be there unless you had business or your destination was Big Ed's. It was worth the search. Not I crave BBQ. Go figure. Greg, I dream about bbq. Don't tell anyone. Do you count pigs to go to sleep? 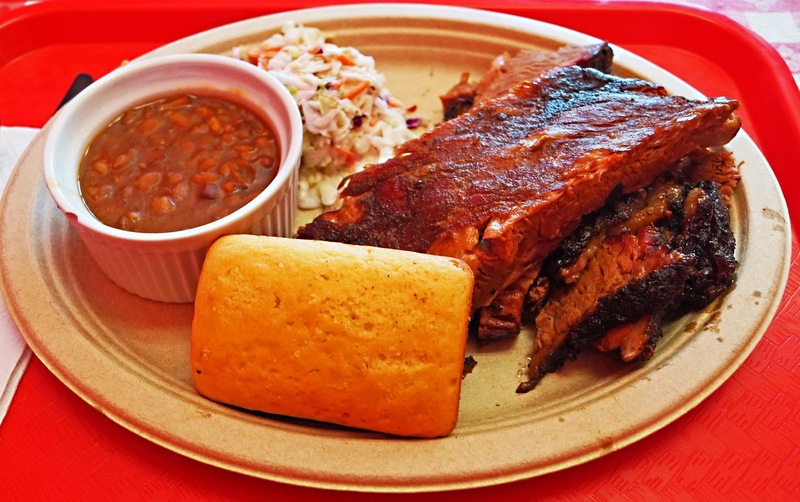 Three Dogs BBQ, I sleep very soundly though I wake up in a puddle of drool and bbq sauce.